Use of Geographic Information System (GIS) technologies in local government varies greatly. GIS help city agencies to answer many questions and facilitate the performance of a great number of day-to-day activities. In almost any situation, when dealing with GIS information in local governments, GIS specialists must provide services to government leaders and to staff of other departments. Furthermore, spatial, or geographic, data often needs to be available to the public audience via the Web. To address those needs, the results of the performed research offer numerous insights and implications for using GIS in the Web to the study of local government workflows. This study can be useful to a variety of readers from different disciplines. Specialists interested in municipal GIS design and implementation could find much of significance in this work. 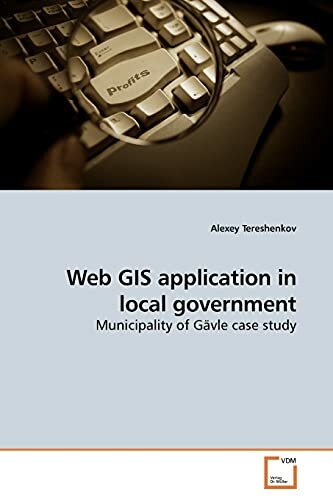 Those readers concerned with the use of web programming and applications of GIS software in local government might also find much of value in the study. The book might be useful to academics and nonacademics as well, such as those involved in government GIS workflows and web mapping application development. Alexey V. Tereshenkov, MSc in Geomatics: Studied Geographic Information Systems (GIS) at University of Gävle (Sweden). GIS Consultant at ESRI S-GROUP Sverige, Sweden.